When it reaches this time of year the air is chilly and the sun rises much later than the summer months. The dark, cold mornings sends me back four years as if it were yesterday. I can feel the heightened sense of awareness I had and the anticipation that something so profound is taking place that it is forever irreversible. The exact emotions from those four year old mornings still come back. They are intimate friends who visit the same time each year, and unlike me, they don’t seem to age. 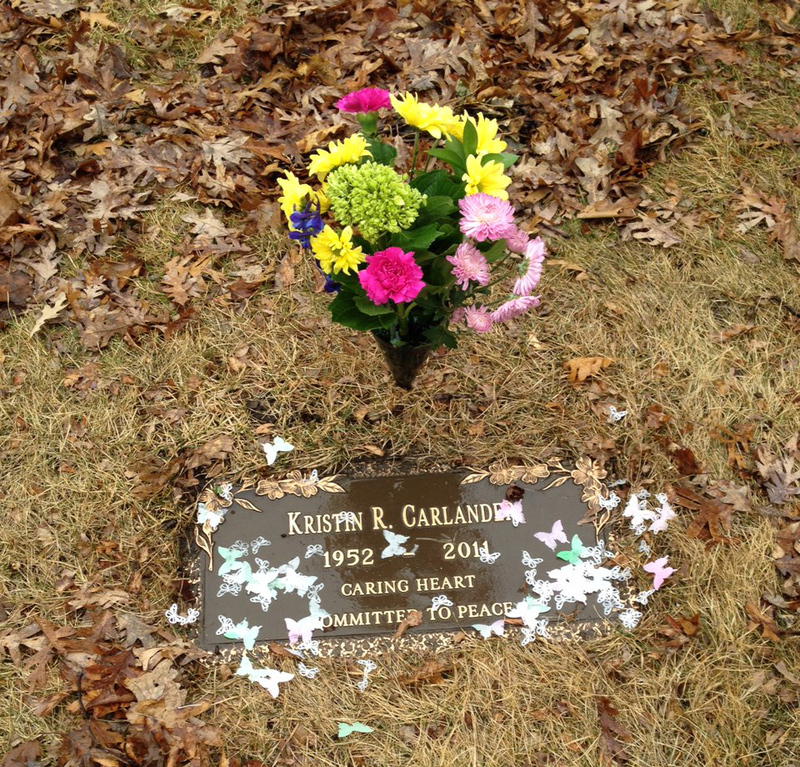 It’s hard to believe that last Sunday was four years since Kris’ departure. Time goes so quickly and comprehension takes so long. On this “passing” anniversary I took the day to be alone, to reflect, visit the site where we buried part of her ashes and read the journal which I began writing the morning she left. Believe it or not, I had a great day. On one hand, what’s to understand other than we are all coming and going? This “coming and going” cycle has been happening for quite a long time and it’s absolutely nothing new or surprising. We see it all around us. Yet it is surprising when it hits home. It is an abrupt ceasing of a continuum with no reset or rewind button. Even old acquaintances who I don’t particularly like, and have no interest in seeing, can be reached through Facebook. Not Kris. There’s something terribly ironic about that for me. I saw an article recently about a young woman, overcome by cancer, who was going to have her brain preserved through cryogenics with the hope they could bring her back one day. I know that’s an unusual enough story to grab a lot of attention. But what really got to me was the photo of her and her husband on a mattress laid out on the floor. She is on her back covered to above the waist with a blanket and dressed in pj’s. The picture caption says it was taken during the last days of her existence. She seems to be very withdrawn and in a state I recognize from having watched Kris. He is slightly curled up fetal style next to her with his head resting on, or next to, her covered legs. He is looking up towards her face and clutches the blanket by her waist as if trying to hold her back from going somewhere. There is a sad beauty to this photo. The caregiver husband is helpless except to be there, be loving and execute his wife’s wishes. He has to witness it all and remain behind to remember what he saw and how he participated. I just loved how he managed to stay close to her during this winding down phase. What most people in an end-of-life caregiving situation don’t realize (unless they’ve been through it before) is that as hard as the caregiving may be, something more difficult is just down the road – the aftermath. I remember the hospice nurse telling me many times, “Ira, be ready for when this is over. It will come as a jolt.” Though this didn’t resonate for me at the time, she was right. The hardest part has been afterwards. Why? Oh man, there are just so many reasons. But what makes these reasons particularly tough is they go on and on. Unlike us humans, these reasons die hard. I’m sure some can persist for the rest of a person’s life. I’m sure we all know this but it’s great to hear it coming out of such an extensive survey. It’s very easy when caregiving to lose sight of ourselves and get overwhelmed. We can ourselves get sick, irritable and maybe find ourselves not be able to do anything at all. Still, it’s hard to consider taking time away and regrouping, especially if you are taking care of someone at home. But the guilt doesn’t go away when all is finished, it just morphs into something new; “Oh, only if I had….”. Wow, I wish I had read that early on. There was probably a lot more ground to cover than I was comfortable to venture in to with Kris. As a matter of fact, I’m certain there was – and that continues to be a sore point for me. It’s one thing to feel some guilt while caregiving, but it doesn’t stop there. I can think of so many things now I could have done to make her existence better, like talking to her more. But at the time I could only see the obvious day to day needs like making sure the meds were taken, she was free from pain and that I had a big supply of mashed potatoes (she loved eating mashed potatoes during her final weeks). The less obvious was harder to get to. So, though I am having such great ideas now, there is nothing to do with them. Maybe I’ll end up in another caregiving situation and will be that much wiser. There is a lot of great material out there for caregivers about this. As I’ve mentioned before, I’m currently quite fond of the work of Atul Gawande. He takes the business of elder care and dying to a level of humanity that is so valuable not only for the person being cared for but also for the caregiver. It’s a lot better to be conscious during the entire episode and not have to live with reviewing what happened over and over again. It’s far better to be well informed and have some insights as to what our loved ones may be going through not only physically, but mentally and emotionally. For them it would translate into a better transition. And for those of us who remain behind we might remember the natural beauty of how a loved one left our world and the small but important part we played in it. Ira, your insights into caregiving and dying have always moved me. You were gong through this with Kris, which I was going through it with my mother. In March it will be three years that she is gone. I too have read BEING MORTAL by Atul Gawande and written about his work and read ALL of his books. I do think as people we learn as we grow, an old saying, but very true. But I also think it’s not healthy to look back and wish for something else–if we couldn’t conjure it then–so be it. Your post offers insights for others and Kris in her love for you would say–yes, another gift. It’s always great to hear from you Beth, thanks for your comments. I read something this morning in a wonderful book I’m reading now called “I Will Not Forget You” by Ellen Sue Stern. Each page is discreet and has a focus for someone grieving. One page has an affirmation that goes, “I did everything I could and that was enough”. It’s a great thing to read and take in – although hard to accept! Ira, Not sure how I missed this post (probably because I was in the middle of finishing my book) but this is a good time for me to read your soothing words as I approach the second anniversary of Richard’s life transition. My two year experience of life after Caregiving has had its “ups and downs.” I have had people tell me to “just move on,” …how does one “just move on?” The worst caregiving day pales in comparison to life after caregiving ends! As time goes by, the pain gets softer, but the love and care never ends. My faith tells me that I will see him again, my mind tells me that he is forever pain free, my heart tells me that he is right beside me. This is a perfect time for me to be reading this post! Hi Chris, great to hear from you as always. I’ve been keeping up on your work and have turned on a number of people on to your wonderful book “What’s the Deal With Caregiving?“. They have been very appreciative. I love this quote of yours “As time goes by, the pain gets softer, but the love and care never ends. My faith tells me that I will see him again, my mind tells me that he is forever pain free, my heart tells me that he is right beside me. ” Thanks again for your wonderful comments and support. Thanks Ira, good to be in touch with you again. Lot’s to catch up on, hopefully we can do that soon. Thanks so much for supporting my book! Looking forward chatting with you!